Faraway Press: The Online Home of John Jackson Miller: Marvel slates THE OLD REPUBLIC Vol. 2 for March release! Marvel slates THE OLD REPUBLIC Vol. 2 for March release! I've been busy doing proofreading rounds on three novels at once — the Star Trek Prey trilogy, out this fall — so I haven't had much time to post. But I can share some news works upcoming and already out! Marvel has just announced a March 21, 2017 release date for Star Wars Legends: The Old Republic Epic Collection Vol. 2, containing the middle third of my Knights of the Old Republic comics saga. In addition to issues #19-37, it includes my in-universe text pages, reprinted for the first time — and also for the first time, the volume reprints the rare KOTOR Handbook that we did in 2007. Great art from Brian Ching, Dustin Weaver, and many more! The book is available for preorder from Amazon and will be at your local bookseller. I hope to see copies before Midsouthcon later that month in Memphis, which I usually attend. Cover to come, but at right is the cover to the Handbook, which you can read more about here. You can also get the first volume from Amazon or, if you want an autographed copy, directly from my shop. 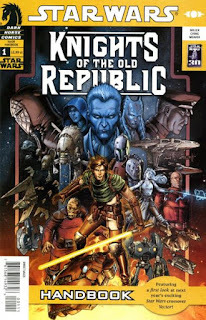 Once the third volume is released, we'll finally have the complete comics KOTOR including all the text pages in one nice set. I also have a couple of pieces in Entertainment Weekly's new Star Trek commemorative issue. My next appearances are at GeekKon in Madison, Wis., in August, and DoDecaCon in Columbia, Mo., in September. Update concluded — back to work!